Learning how to shoot a basketball can be frustrating. These basketball shooting tips will help minimize player frustration while keeping the focus on the process and not the product during the early learning stages. Learning any new skill involves a learning curve. And depending on size, strength, age, and ability level some players' curves will be steeper than others. That means that, at first, there will be lots more misses than makes. And that's OK.
As long as players are reminded that becoming a good shooter is a process: Repeating the right things over a long period of time until the mechanics become automatic. When teaching young players how to shoot a basketball, it's really important to break down every component of the basketball shooting form. Take the time to teach what every part of the body should be doing from the feet all the way up to the eyes. I can't emphasize enough the importance of good mechanics. But at the beginning, the focus should be on proper mechanics as opposed to whether the ball goes in or not. Since many young players lack the strength to get the ball up to the basket, the temptation is really strong to jack up the shot in whatever manner allows them to make a shot or two. I definitely discourage them from doing that. This very short-sighted approach will only hurt their shooting form in the long run. Sure, they might make a few more baskets in the short term, but it won't help them down the road. Encourage your players to continue using the proper technique and assure them that when they get a little bigger and stronger their patience and hard work will really pay off! That's one of the reasons I believe young kids should use an 8-foot goal instead of the standard 10-foot goal. They can experience a lot more success and at least have a chance of hitting something besides air until they develop enough strength to shoot at the taller goal. I also insist my young players shoot from close range. It's impossible for them to shoot the ball correctly if they get too far out. 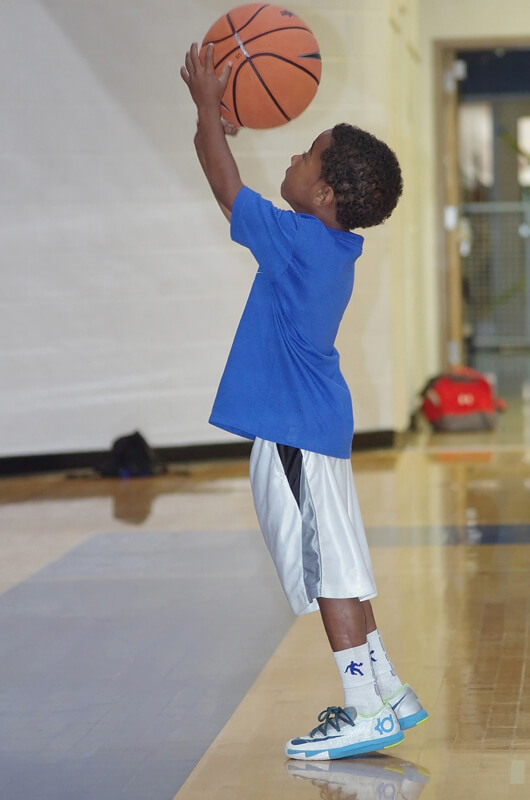 There's no 3-point shot included in youth basketball rules, and encouraging beginners to shoot beyond their range does nothing but teach them bad habits. Practice indeed makes perfect. So, make sure your players are practicing good habits! I can't stress enough the importance of getting the fundamentals correct at the very beginning. I've coached many players at the college level who came into our programs with poor shooting habits. These players had already spent years training their muscles how to shoot the ball incorrectly, and their practice of bad habits perfected poor shooting form and low shooting percentages. It's really difficult to unlearn mistakes that have been ingrained. Try some of these basketball shooting drills and games to help build good shooting habits. 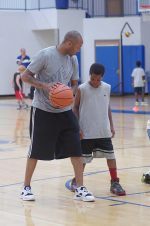 When teaching basic basketball shooting skills to kids, start with little goals and modify them as needed. Ultimately, the end goal is a made shot. But until that can happen, there are lots of steps along the way that can be celebrated. Start by praising small successes, like a good follow through, shooting the ball in a straight line, having good balance, keeping the elbow in, etc. Pick a target on the floor or wall and have them shoot the ball toward it. Praise their ability to hit the target with more consistency. Then have them step back and try again. Finally, have them shoot at a short goal and have them aim for a spot on the rim or backboard. Don't worry if the ball goes through the net, but praise them for hitting their targets. Shooting is just one part of the game. Youngsters also need to master other basic basketball skills if they want to become great players. Youth basketball drills are a great way to work on skills like dribbling, passing, rebounding, and defending.